Snow, clouds, birds, mountains, what do they have in common but the beautifully cold white color? White, despite how simple it is, it symbolizes peace and mightiness, solidity and greatness. Tell me can you easily reach the top of the mountain or the clouds in the atmosphere? Or how easy it is to hold snow in the palm of your hands? White is a very meaningful color, as it’s the most complete and the purest of all. So, honoring this powerful color, 61 best white nail designs are given to you as a gift from us. White, the extremity and natural mixture of colors, the opposite of black, yet its natural complement. It is the symbol of angels, and all that is good in life. It provides the person with a feeling of completion and wholeness. How amazing would it be once we insert this magnificent color in our daily routine, basically in our nail designs!! What’s more beautiful than having a cup of coffee on a snowy day? It’s having a cup of coffee while wearing your white as snow nail polish! Then heading outside to show off your pretty nails and make snow angels. Now if that doesn’t help you turn frowns upside down, then I don’t know what will! Manicure is not about how shiny it looks or how glossy it appears, it’s all about the simplicity or complex of its design. And the matte nails are a sign of elegance. and when a girl is trying to show off her grace and poise, matte colors bring out her best. Almost every one of us likes to keep things simple, but not too simple, if you know what I mean. Ladies have a thing for charm, and it appears in everything they do, or wear, nails included. That’s why it feels so good to wear a soft white nail polish then bring it to life with golden glitter on your accent nail. But don’t keep it to your fingernails only, get busy on your toes too. It’s worth it! Who said it’s all about the length of your nails? Well, whoever said that has probably never tried the pleasure of short nail designs. A plain white coat on your cute short nails has the same effect as on long ones, but a little bit cuter. It’s a matter of design and color, not length. For extra details, check out 50 Hypnotic Short Nail Designs To Create The Buzz. If you’re in the mood for some freestyle, then why not demonstrate your scribbles on your nail beds? Position your own self-designs in different positions on your nails to provide a stylish mess. You know it deep in your heart that he’s the right one for you when you can’t seem to stop thinking about him, and you eat, sleep, and breathe his essence. What are you waiting for then? Show him how much he means to you! Put on some nice white manicure coat, and refresh it with some love polka dots, and maybe a love word of your choice. You could even write his name on one of your nails. How special would that make him feel?! On a hot summer day, ice cream refresh your right away! Remember with me how cold, and delicious vanilla ice cream is. I don’t know about you, but the simple thought of it makes my mouth water. How come you’ve never tried it as your nail design?! A pattern is a very attractive design and has a variety of types. You could use a flower pattern, a musical pattern… etc. But have you thought about the fading squares’ pattern? Drawing a group of black squares on a base of white nail polish and make them look as though they’re disappearing is a lovely thing to do. And it’s a pretty thing to see. Diamonds, the hardest yet most beautiful rhinestone discovered yet. But also they’re the most expensive. Unless you’re a wealthy millionaire, you can rarely afford one. But why spend money on something you’ll always fear its loss when you can imitate its existence? Your own hand-drawn diamond is just a nail drop away. It isn’t on the empty side of the glass, it’s on the full side. Having a cross section on your nails doesn’t make them any less attractive than having a full nail bed coat. It’s an interesting white nail design to try. A stripe is a definition of unique. Do you think you can handle stripes? If you do, then let’s see how special are you. Don’t want things to be super simple? Add an extra color to your white and black nails. Whether it’s silver or gold, both will make your nails shine so bright, and will go beyond the simplicity of the two opposite colors. You are almost there! White dominates the entire area leaving black defenseless. It’s just a matter of a few more moves before white checkmates, or so it seems. Will black be able to regain his strength? Let’s wait and see. If you’re out of designing ideas, look around you for inspiration. Fissures and broken walls or even earthquakes provide a good example of unexpected things to use in a design. The process is so simple, too. You could pretend your hand is unsteady, and the broken line will appear on your nail! Hearts, bow ties, and stripes, I don’t know if you see it too, but this style has Minnie written all over it. Complete the look with a mini skirt, and a big bow on top of your head then head forward to Disney. They’ll be waiting for you on the next episode of Mickey Mouse. Good morning sunshine! It’s a new day, and the time has come for you to get out of your bed. Some sun rays have escaped your curtains already reminding you to open your petals and bloom. It feels so good to be an honest person, this will make people see through you clearly. And once they get to see the true you, they’ll find a crystal bright heart, pure and innocent. Who said an empty space always needs to be filled up? Sometimes void creates beauty that a filled space never can. You have to keep in mind that everything is beautiful in its own way. The weather is hot and you can’t handle it? Hawaii is an airplane flight away! Ocean waves to entertain you, the tropical breeze to keep you fresh, and pineapple Juice to re-energize you. If that isn’t one of the perfect summer days, then Heaven is your next choice. Close your eyes and think about your most desires. Now make a wish, something only you know about, and crave to happen, then blow the petals of your dandelion. Now watch as your dreams travel with the wind to the land of happily ever after. Not only spiders can have webs, in an artistic mind, anything can happen. Pigs can fly, lions can run away from dear, and flowers can have their own webs. A simple grid of lines behind your precious flowers is enough to create your floral web and blow other people’s minds. Who isn’t in love with the 101 Dalmatians? They combine the best of both: dogs, and black-white relationship. Those cute little puppies will shower you with love like a thousand friend. No need for complication, in pursuit of innovation, a little bit of this and a little bit of that will make a good creation. Draw your own designs in the see through method, where you remove part of your own manicure in the shape desired, and come up with a bunch of chevrons, stripes, and irregular shapes. Having a swirly mood? Exhale all your knots and twists of thoughts outside, and imprison them inside your fingertips. Then, add your feminine touch to go along the swirls. A dash of glitter or a couple of rhinestones can seal the deal. Who said chiffon only works as a great fabric for little black dresses? Don’t worry, they don’t only do a great job as seducing fabric they also play a dashing role as a proactive accent nail idea designed especially for an evening with your special someone whom you’ve been trying to impress for so long. Catch your crystal drops as they fall from the clouds of art, and arrange them to form a magical look. Soon to be the bride? No pressure! Your nails are ready for you. 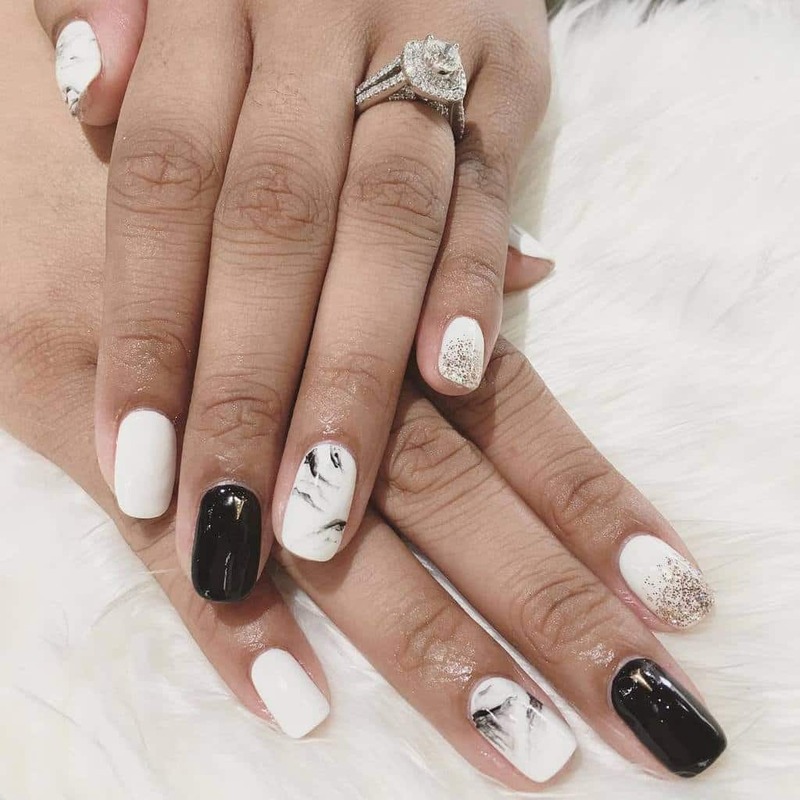 A beautiful white nail design of shapes and patterns, along with silver gems to complete the look is all you need to have in order to look dazzling and have your manicure match your wedding ring. White and silver stick together like glue. Now you can rest while you know for sure that your wedding look is saved. Life is not about always remembering your past and regretting it, it’s about looking forward to a brighter future. Stop asking what would have happened if, or why didn’t I do! Keep your eyes towards the horizon, and always plan for a better future. Are you sick of the quote “Be positive”? You’re right. I mean those who say this don’t really know how you’re feeling. Sometimes you need the negative in order to understand the importance of the positive. Shine bright like a diamond ladies, because a woman’s beauty is the only thing she can be unique in! Go out and give a shout out to your peaceful life you wanna live through by wearing this white nail design with decals and silver glitter. In love with flowers and including them in your fashion style? This nail white design provides you with what you are searching for because it contains many colorful cherry blossoms. While you ladies are happily enjoying your delicious burger or your hot dog, ketchup drops go all over your T-shirts leaving their tasty marks everywhere! 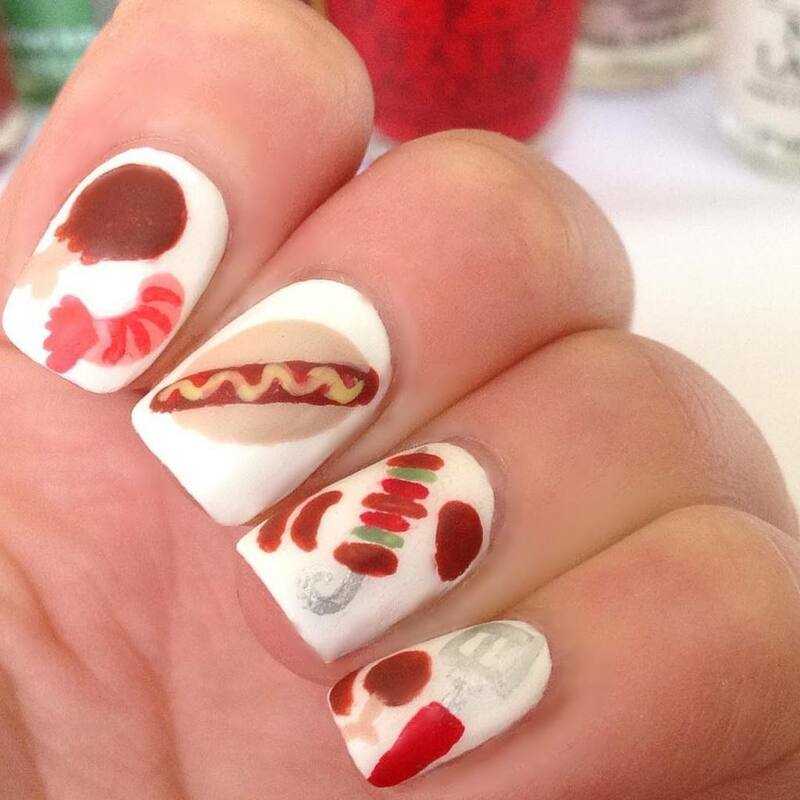 So if you are a burger lover don’t miss wearing this cool and teenage white nail design. On a simple snow white nail design, apply a silver glitter spill that turns your nails into shiny and gloomy stars that shine bright like diamonds in the dark black nights. About to be a bride? No pressure! With this bridal white nail design and your chiffon pattern in the ring finger, you can totally rest and sit back in peace knowing that your bridal look is totally saved. Life is not simple, and now it is the time to read between the lines! Wear this nail design made up from a white bottom and a silver tip separated by a transparent line that represents a life break between the good and the bad, the positive and the negative. 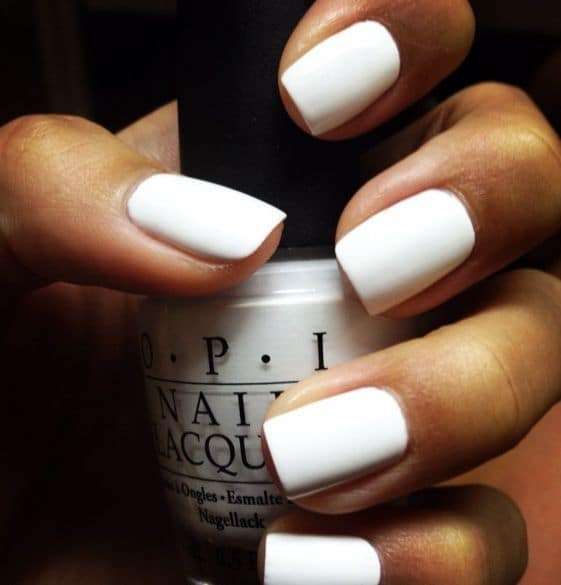 Stone cold clear white used simply in a white nail design is too cliche and can be worn on any occasion. In order to turn thins into motion, add a mirror-like shiny golden decal in your ring finger that is responsible for the reflection of your beauty. Besides all of the white nail polish used in this nail design, the patterns used in the ring and index finger are astonishing! Where the index one has a shiny glittery chevron bottom and the ring fingernail has an X theme that reminds me of the famous x factor TV program. A flower lover lady? Here you go, this french tip white nail design with a flower touch that makes it seems like tiny fresh flowers are sprouting from the tip of your nails is all yours now! In the middle of all white nails exists a decorated one with small dots that represent the colors of the disco ball hung up in a nightclub or a party. Be careful, summer is knocking on doors, so if you are planning for a night out with the friends this white nail design is the perfect one to wear on. Having a good day in this bright colorful life? Represent your joyful day and life by wearing this white nail design made up from a simple fresh snow white base and a colorful tip from a color of your choice. But don’t forget to add that silver line that separates the white from the tip because it adds a cool taste to your nail design. Valentine’s day is here and you are all wearing a red color? 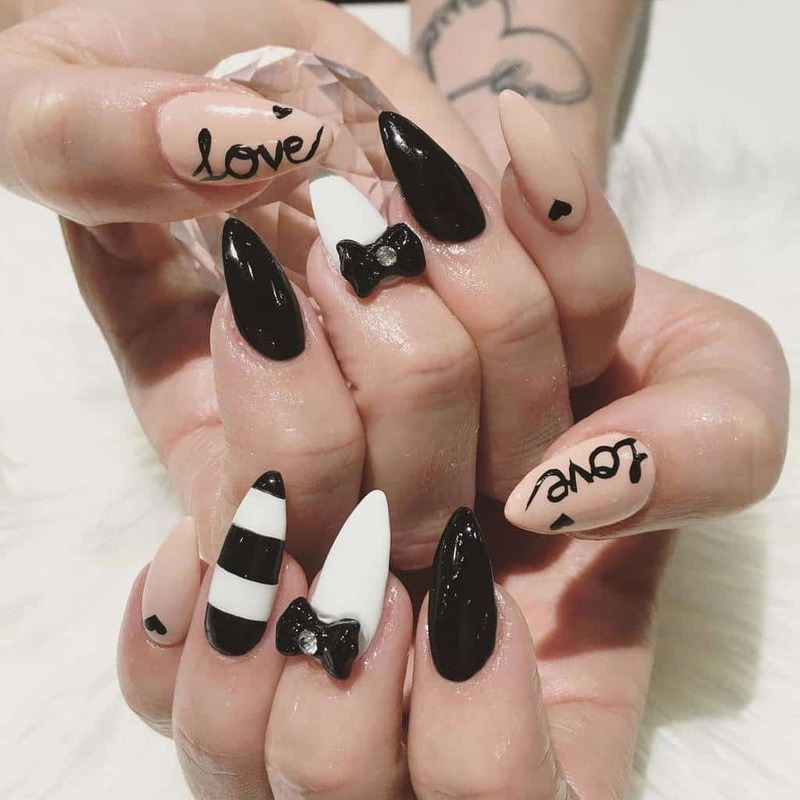 Relax, because this black and white nail design is here to give a break from the red color and to add a sense of difference and attraction to your nails. Summer is on doors! So what about taking a flight ticket to Hawaii? A great idea isn’t it?! But before you leave, do not forget to wear a fresh nail design with the lotus flower in order to greet the Hawaii beach in a look full of summer vibes and full of the Hawaii sea chore love. Have you ever thought of having the marble pattern in your nail designs? Well, it is the time to think of this because the way two colors are merged together in such a pattern is brilliant. The black and the white color here are not mixed randomly and badly but in a classy way! Most of you ladies think that the cow pattern is a bad one. On the contrary, this nail design proved you wrong! The black and white cow pattern nail design is a fancy one when applied on round shaped nails. Unlike all the above white nail designs, this nail design has the light brown color decorated with a white pattern and surrounded by white nail polish edges. Spring arrival must be greeted by you ladies with a floral spirit that is full of the fresh flower natural scent. So if you are a flower lover and you wanna greet spring where your love is born, try wearing this nail design full of tangerine roses. Pattern it all up because you ladies are done with simplicity and such cliche nail designs. Wake up! It is time for you to update your style from simple to fancy by using patterns. Fly up in the sky, and travel between a sky and another, just like a balloon! By wearing this white nail design with colorful dotted tips that look like far colorful balloons. As a conclusion, white, the extremity and natural mixture of colors and the opposite of black, is the best color that should be entered in our daily routine and especially on our nail designs. 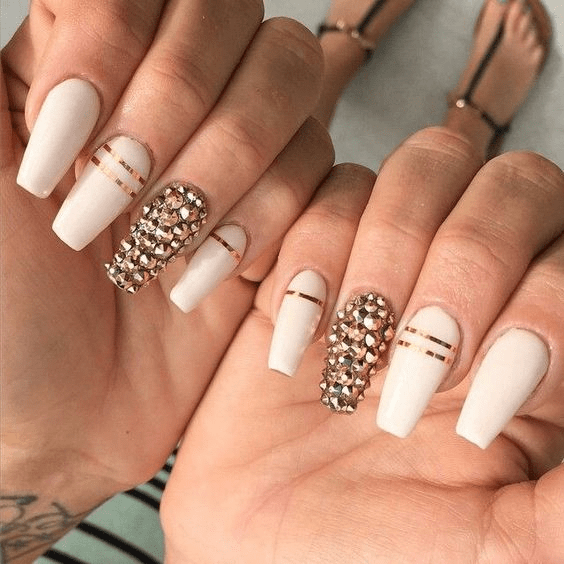 However, the above list of 61 white nail designs provides you ladies with a big variety and examples on white nail designs that are breathtaking and are going to blow your minds. Hope you enjoyed them!